Puts an end to hot, stuffy cabins and sleepless nights. 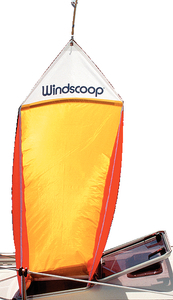 Aerodynamically designed to force slightest breeze down into cabin for coolness and comfort. Seams are double stitched. Two battens are sewn in place. Can be hung from halyard, boom or roller furling sheet. Fits any hatch or companionway up to 4' wide. Nothing to install. Has no tie-downs. Works with most screens. Complete with nylon storage bag.